Milk cartons are water tight paper containers used for packaging milk for retail distribution. One of the most common supermarket items, and found in nearly every home, the milk carton is nonetheless a precision product, manufactured according to exacting standards. Up until recent times, milk was not usually available as a retail item. Once milk is removed from the cow, it spoils quickly in heat, and is vulnerable to contamination. Until this century, the most economical and hygienic way to store milk was to leave it in the animal. In Europe, a town cow keeper would bring his or her cow directly to the doorstep of the customer, and milk the animal there into a household container. In some places, milk was sold from a shop next door to the cow stall. In either case, the milk could not be safely stored for anything but a small amount of time. A large metal milk container was developed in Europe between 1860 and 1870. Called a churn, the lidded metal container could hold about 21.12 gal (801) of milk. Milk in churns was shipped by rail from farming areas into towns, where the demand for milk was high. Milk in metal churns was also dispensed door to door. Instead of the cow keeper bringing the cow, now the milk was ladled out of the churn into a smaller household bucket or can. The glass milk bottle was invented in 1884. This offered convenience to milk consumers, since the sterilized bottles could be kept sealed until needed. Milk that was pasteurized (quickly heated to above boiling, then cooled) was resistant to bacterial contamination and spoilage for several days. Bottled milk became prevalent across the United States and Europe through World War II, though glass containers are rarely seen now. The first paper milk carton was introduced in 1933. Wax was applied to the paper, to make it waterproof. In 1940, polyethylene was introduced as the waterproofing material. Refillable glass bottles reigned for a long time after milk cartons were introduced, but by 1968, over 70% of milk packaged in the United States went into paper cartons. 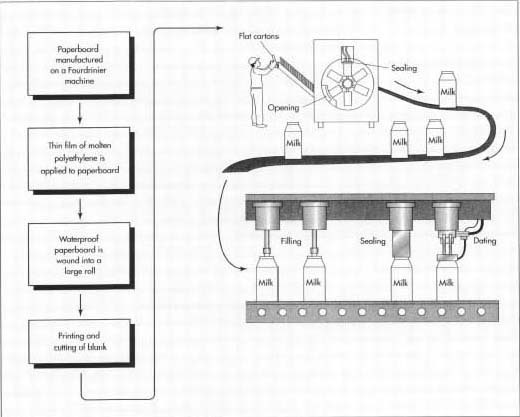 The manufacture of milk cartons is actually a two-step process, at two different locations. The carton manufacturer cuts and prints the carton, which is shipped in a "knocked down" or flattened form to the milk packager. The packager completes the process by forming, filling, and sealing the carton. Milk containers are made from paperboard coated with a waterproof plastic, generally polyethylene. The wood pulp that is used to make paperboard for milk cartons is a blend of softwood and hardwood. Softwood is usually a type of pine, though the actual trees used vary depending on the location of the paper mill. Softwood produces long wood fibers that provide strength to the paperboard. Hardwood comes from deciduous trees such as oaks. Hardwood has shorter fibers that make for a better printing surface. Pulp for milk carton board is usually 60% hardwood and 40% soft. Several other chemicals are used to make milk cartons. One is oxygenated chlorine, which bleaches the wood pulp. Other chemicals specific to each manufacturer are added to the paper to add strength. Chemical pigments in the ink are used for the printing process as well. 1 The heavy paper used for milk cartons is categorized as a type of paperboard. It is typically made on a Fourdrinier machine, one of the oldest and most common types of papermaking equipment. The process begins with wood chips. The chips are heated and bathed in chemicals that soften them and break them into small bits of wood fiber. The pulp is bleached in a bath of oxygenated chlorine. The pulp is then washed and passed through several screens, to remove debris. Next, the pulp is fed through a machine called a refiner, which grinds the wood fibers between rotating disks. The refined pulp flows into the headbox of the Fourdrinier machine. In the headbox, a mixture of water and pulp is spread across a continually moving screen. The water drains away below through the openings in the screen, leaving a mat of damp wood fiber. The mat is drawn through huge rollers that squeeze out additional water. Next, the paperboard is dried, by passing it over steam-heated cylinders. 2 The dried paperboard next moves through the rollers of an extruder. As the paperboard is pulled through the rollers, the machine extrudes a small amount of molten polyethylene. The polyethylene clings to both sides of the paperboard in a thin film. Several grades of polyethylene may be combined in the extruder, and the machine actually lays down multiple layers of film in one pass. The different layers accomplish different tasks, such as reducing moisture penetration, reducing oxygen penetration, and aiding in essential oil retention. As the paperboard comes through the extruder, it passes over a chilled roller, which cools both surfaces. The paper now has an extremely glossy, waterproof finish. It is wound into a large roll, to be transported to the printing area. The roll is typically 120 in (3.05 m) wide, too big to fit onto the printing and cutting machine. The large roll is slit into narrower rolls, the width determined by the desired dimensions of the finished carton. 3 Printing is usually done by the flexo-graphic method, which uses rubber printing plates attached to steel shells. Workers load the roll of polyethylene-coated paperboard into the press. The press prints the words and images of the milk carton onto the paperboard. A typical milk carton might be printed in anything from one to seven colors. All of the colors are printed at one pass through the machine. Next, the same machine scores the paperboard along what will be the edges of the carton, where the box will fold later. A die lowers, and stamps out the carton. If you cut open an empty milk carton down one side and across the bottom and unfold it, you can see the shape of the cut piece. This flat, scored, and printed piece is called a blank. The high-speed printing and cutting equipment turns out hundreds of blanks per minute. 4 Workers at the carton plant next load the blanks into a sealing machine. The machine takes the flat blank and folds it laterally, creating an overlapping side seam. The seam is then heated and squeezed together. The heated polyethylene bonds and the seam are strong and watertight without any additional glue. Thousands of blanks per minute shoot through the sealing machine. This is the final step at the carton manufacturer. The rest of the process is completed at the dairy. The sealed and folded blanks are loaded into corrugated cartons, and they are shipped. Specialized machinery transforms the milk carton blanks into open containers. First, blanks are loaded into a chute leading into the forming machine. The blanks are pulled by suction down onto mechanical arms called forming mandrels, and the carton is snapped open along its scored lines, and overlap the two bottom flaps. As the carton on the mandrel reaches the top of the wheel, the bottom of the carton is pressed against a hot plate that descends and seals the bottom seam. the mandrel reaches the top of the wheel, the bottom of the carton is pressed against a hot plate that descends and seals the bottom seam. As the wheel continues to rotate, the bottom-sealed carton moves down, and is pulled by suction off the forming mandrel and set down on a conveyor belt. 6 The conveyor belt moves the carton to the filling area. Milk from the dairy's storage area descends by pipes to the filling machine. A pre-measured amount of milk fills a chamber above the carton. Then the milk is released through a spout into the carton. The filled carton passes along on the conveyor belt to the top-sealing machine. The top-sealing machine lowers onto the carton and pinches the top together along pre-scored lines. The shape of the conventional milk carton is called gable-topped. The top-sealer forms the gable, and heats and presses the top seam together. As in all the other seams, the polyethylene bonds to itself, and no additional glue is needed. only a few seconds. 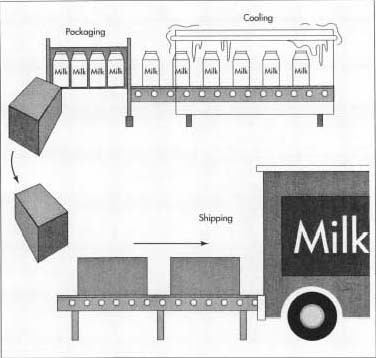 After the date is stamped, the finished milk carton moves off the conveyor, and is packed either automatically or by hand into a packing case, for shipment to market. Manufacturers make quality checks at every step along the manufacturing process. The pulp must be inspected to make sure it is the proper color and density, and has the desired fiber characteristics. As the pulp is a blend of long and short fibers, from soft and hard-wood trees, batches may differ according to the kind and proportion of trees used. The paperboard must pass numerous quality checks, for different reasons. The Federal Drug Administration (FDA) requires that milk cartons meet strict standards for hygiene and safety. For instance, the FDA must approve any chemicals added to the paperboard and the manufacturer must be able to prove it is meeting its regulated requirements. The width, thickness, and fiber mix of the paperboard is continually monitored by instruments attached to the paper-making machine, and the board is checked for contaminants as well. At the dairy or milk processing plant, forming and filling of the cartons is done under exacting standards for hygiene and safety. The manufacturing process for milk cartons is extremely efficient, and there is very little waste. However, most used cartons are thrown in the trash and end up in landfills. It is possible to recycle them, though, if the appropriate recycling facilities exist. A milk carton recycler collects empty cartons from large users such as schools and hospitals. Then the recycler shreds the cartons, sanitizes them, and ties the shreds into bales. A pulp mill buys the bales from the recycler. At the mill, the polyethylene coating is separated from the paper, and strained off for re-use by a plastics manufacturer. The shredded cartons are then reprocessed into pulp, and can be used to make high grades of printing and writing paper. Milk carton manufacturing has not changed dramatically for many years, because the process is already highly streamlined and efficient. An increasingly popular modification to the tradition gable-topped carton is the addition of a plastic pour spout, but this requires only minor changes in the manufacturing process. As milk consumption falls in the United States, future changes might be in the graphic design of the cartons, as dairies compete harder for customers. Because the gable-topped cartons are very cost-effective to manufacture, packagers are searching for other products that can be sold in them. However, the polyethylene coating for milk cartons is not appropriate for every liquid. For instance, wine and motor oil have different characteristics than milk, and so need different waterproof barriers. Chemists and design engineers are currently researching new plastic coatings, so that other liquids besides milk can use paper cartons. "Milk Carton Recap." Packaging Digest (August 1994): 36-37. "Milk Carton Recycling Does Everybody Good!" Science Activities (Winter 1994): 5. I would like to the machinery required for manufacturing of milk cartons. As some paper products are made acid free, can milk containers be also considered acid free?